Megan Verrill, Rilley Greenwood, Cayden Childs, Morgan Giard, Ema Lamontagne, and Mia Morin. So, I guess sit back, read, and enjoy? How About a Little Math? This weekend is 33% shorter than last weekend. Last (school) week was 33% longer than the first week, and next week will be 25% longer than this past week. We’ve only been in school for SEVEN days, though it seems like we’ve been there for much longer! We did some more team-building and cooperative challenges this week, as well as creating a visual representation and a poem about who each student is. Students began work for Health/FACS, including creating a SMART Goal and a 50-item bucket list. On Friday, students learned a little bit more about the events of September 11, 2001. This week, we will start a routine schedule. There may be changes. There will be three classes on Maroon days and two classes and PE/FL on White days. Which classes are on which days will vary for each student. Every day will begin with CORE, and it will end with SOAR time. Soon, there will be some options during SOAR time, but for now, it will be an opportunity to read quietly or work on any assignments. This is also a time when Band and Chorus will meet. Teachers are working on extended learning opportunities for students to choose from. This week, we hope to have an opportunity for all students to go to the library for the first time. Also, students will begin to have some homework, including reading for at least 30 minutes per night. Students will need their Apple IDs and passwords ASAP. There is another Parent-Student-iPad night on Tuesday, 9/15 from 6-8pm in the cafeteria, and you can contact our technology department for help. We have done a variety of getting-to-know-you activities, from Human Bingo to ball/beanie toss games to finding things in common. Students have been meeting new people each day, and they are excited about knowing more people’s names. We also tried a few cooperative challenges, including Moonball and the Star Rope activity; some were more frustrating than others! We also started to discuss iPad use, and most are being charged this weekend for use this week. 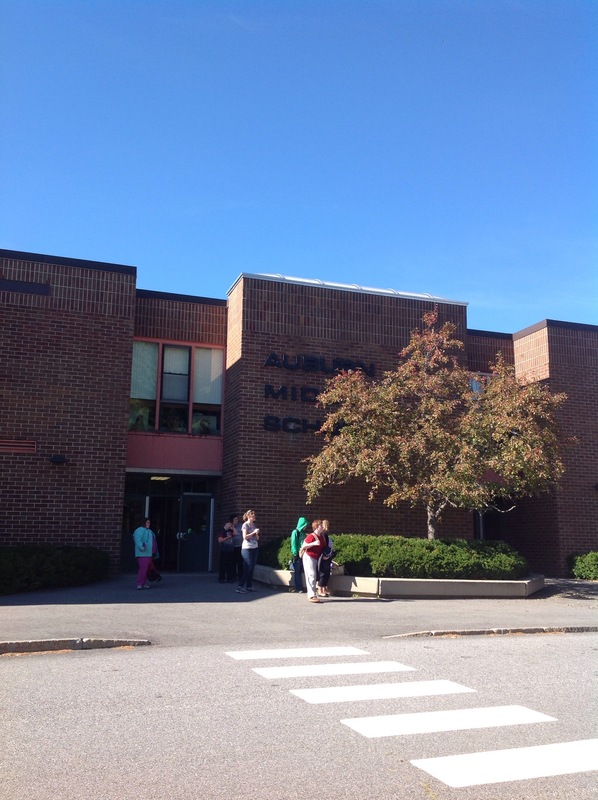 Remember, there is a meeting for parents, students, and iPads on Thursday night from 6-8 at AMS; if you are unable to attend this meeting, you may attend the meeting on Wednesday from 6-8 or on 9/15 from 6-8. If none of these work, please contact us, and we can arrange for you to do this at another time. THIS IS AN IMPORTANT MEETING TO CREATE APPLE IDs AND CONNECT YOUR ACCOUNT WITH MLTI. Apps and resources students will need in class are available for no charge through MLTI, and no iPads will be allowed home without this process completed. There is also information about iPad insurance that will be available at the meeting. The second week will have more team-building time, as well as many opportunities to get to know each other as we work in different groups. We will be discussing our Positive Behavior Intervention System on Tuesday, and we will be exploring Identity throughout the week. Students will also be attending their Physical Education or Foreign Language classes on Wednesday and Friday. Band will take place on Tuesday and Thursday, and Chorus will take place on Wednesday and Friday this week. Picture day is Wednesday, September 9. If you have not received a picture envelope, ask your child–they were sent home last week. All first week paperwork is due this week; please send it in as soon as possible. If there is something that doesn’t pertain to you, please add your child’s name and write that on the paperwork, so we don’t pester you! We are doing a Scentsy fundraiser, and envelopes have gone home. They are all due back on September 28, whether items have been sold or not; payment is also due at that time. We encourage students to try to sell at least one item, as all profits help AMS in many ways, including field trips and celebrations, as well as other learning opportunities. Whew. Now, back to your regularly scheduled Labor Day weekend! Teachers met this week to start planning our new year with our new team. It was exciting to listen to each others’ ideas and what we believe is important in education. We are hoping to help create authentic, hands-on, meaningful learning experiences with a lot of input from students. We created a supply list for this year, which you WILL NOT need immediately. Really, on the first day, you will probably need something to write with, but the rest can wait until at least week 2. We also created a TEACHER WISH LIST. We are grateful for any supplies that we get, but we are especially grateful for soft tissues, whiteboard markers, pens & pencils, and other usual classroom supplies, including those above to have extras on hand. Be on the lookout for information about an ice cream social to meet teachers and classmates. Phew! What a whirlwind! You all just left here, after your scavenger hunt tour, cooperative challenges, and some getting-to-know you activities. We are EXHAUSTED, but excited to work with you in the fall. We will be spending time this summer getting your CORE groups ready and preparing for an awesome year with you. It is Monday night. Your new middle school teachers met this afternoon and prepared for Step-Up Day tomorrow. We are looking forward to meeting you all, and working with you for the afternoon. This is a site where we will share updates and news with you. This is also one location where you will find supply list and beginning of school information. There may be some challenges this summer and opportunities to get to know each other a little bit better. You can also visit our team Facebook page at https://www.facebook.com/AMSTumbledown. You can subscribe to text messages by texting the message @tumbledown to number 81010. Mrs. St. Pierre on Nice to Meet You All!